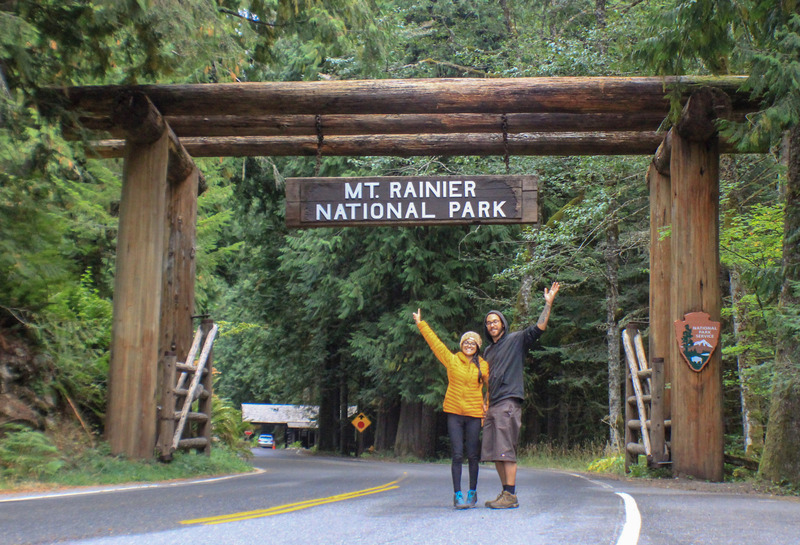 It was officially our third week on the road as we entered the state of Washington. Friends and family who have been to Washington told us that we’d fall in love, and they were right. 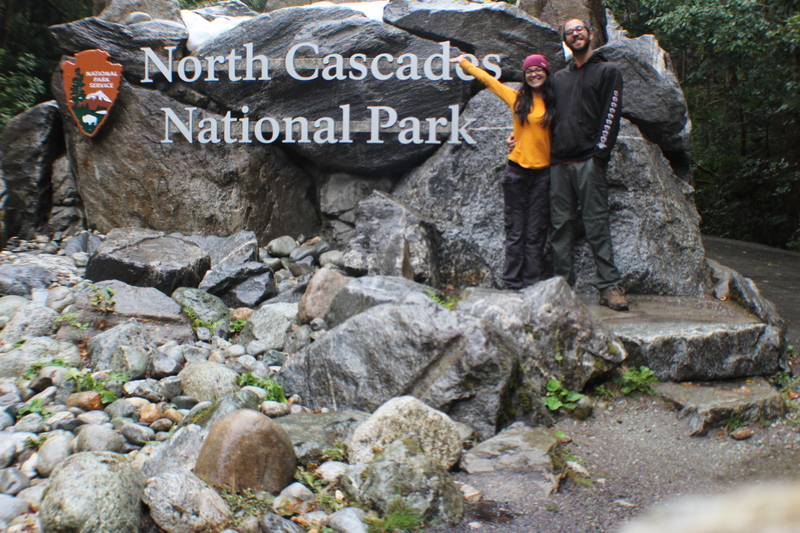 Our first stop, North Cascades National Park. This was our 9th National Park in three weeks. The moment we left Montana and entered Washington, we got tons of rain. We camped at Colonial Creek campground and to our surprise, it was the first day of their off-season, which means no rangers, no reservations, no water, no restrooms and no campfires. It also meant that we were the only ones camping there that night. We found an awesome campsite tucked away near Diablo Lake. We aimed for tree coverage with an awesome view and that’s exactly what we found. The rain stopped just long enough for us to enjoy the lake and mountain view. It felt like a dream being the only ones there that evening. And then we spotted a large paw print in the mud and neither of us could make out what it was. That was kind of scary. We later enjoyed whiskey cuddles as it continued to rain for the rest of the night. The next morning, we woke up to no rain and lots of low clouds. It rained so much that night that the lake actually got bigger. We were able to get a small hike in before the rain that afternoon and rangers warned us about a heavy storm when we stopped by the visitor center. We packed up and moved campsites just down the road about 10 minutes away. 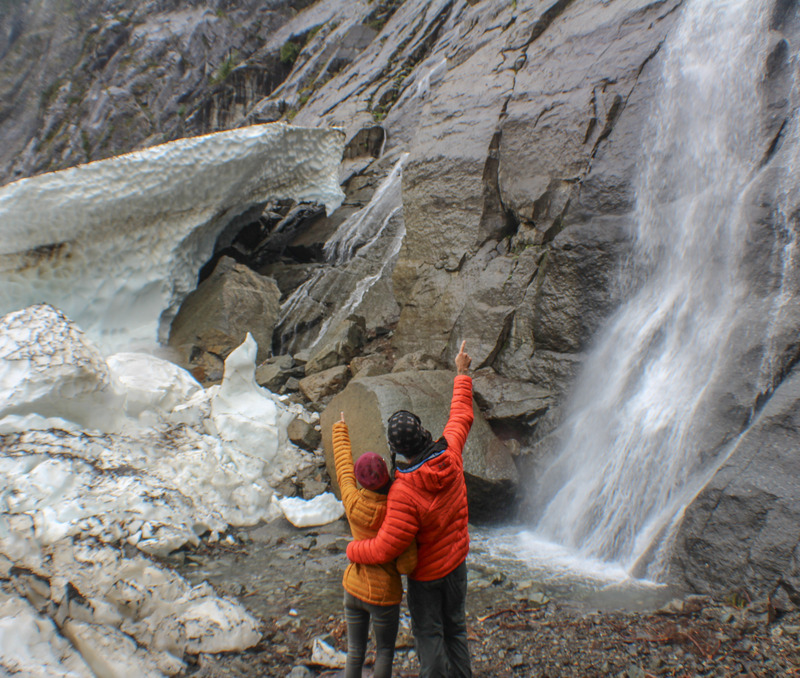 We wanted to experience a different campground within the North Cascades and since it was off-season, there were no fees. 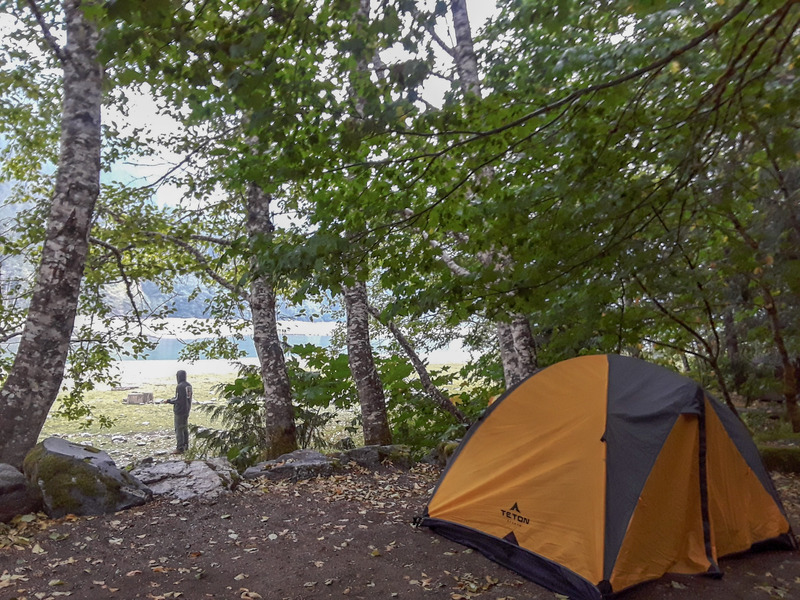 Goodell Campground is located near the Skagit River, which is a very large river. We scored an awesome site with river access and spent the day skipping rocks before the storm came. Well, it rained, and it rained hard all night and all morning. Sleeping in and waiting till the storm passed, we decided to pack up in the rain and get a head start to our next destination. We were both really excited for what was next as we had never seen anything like it before. 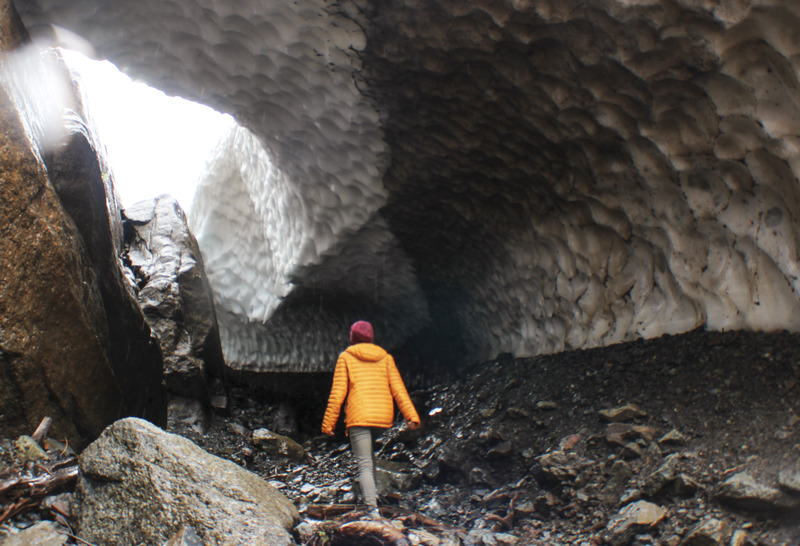 Big Four Ice Caves, located within the Mt.Baker wilderness; these were probably the coolest things we have seen during our time on the road. 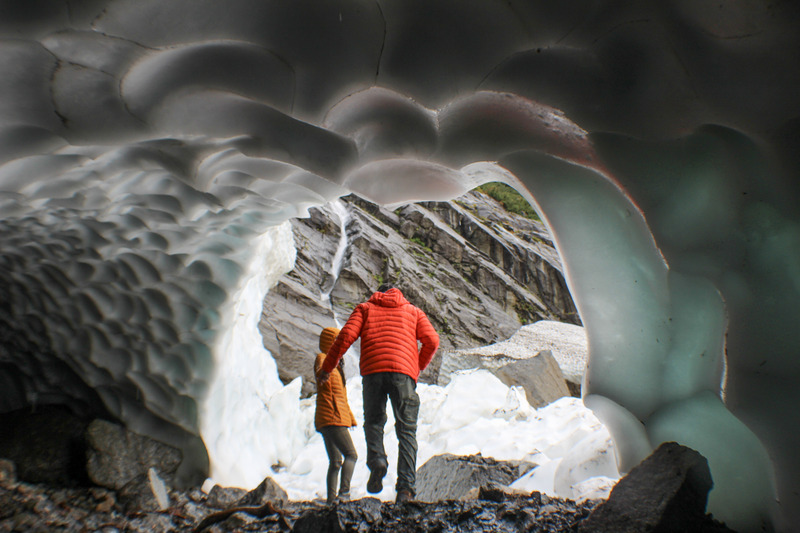 Big Four Ice Caves can be explored by hiking 2.2 miles round-trip with ~220 feet of elevation. 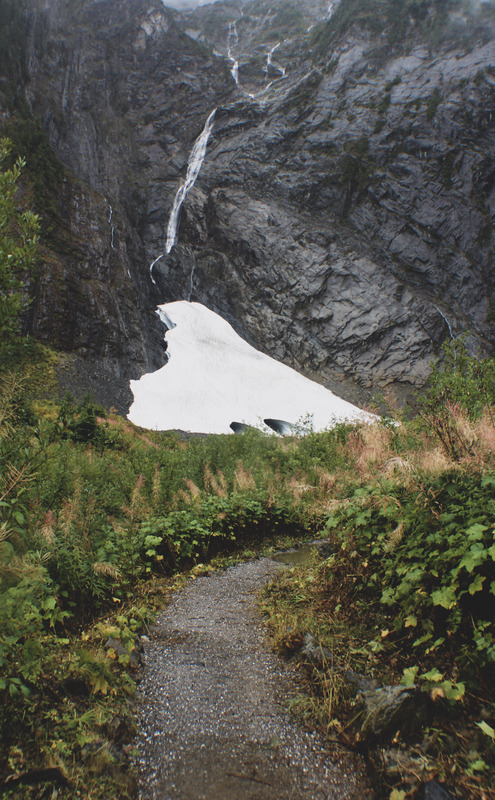 This trail is very maintained and can be hiked by people of all ages. When we arrived we were excited to be the only other car there that day. We prepared day packs and covered up our cameras for a wet experience. Luckily, it was not raining. The hike was beautiful, everything so green and alive. Then we noticed tons of little waterfalls coming down the mountain and into the cave. 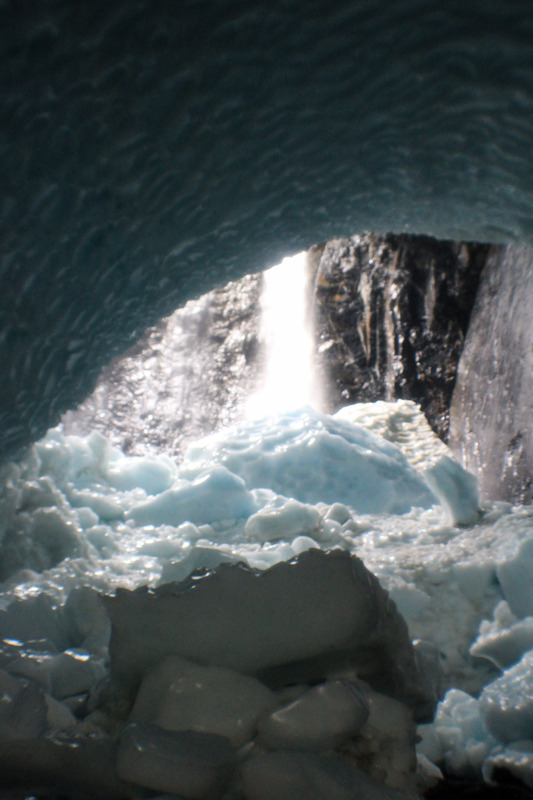 Destination: Waterfall in a Cave. 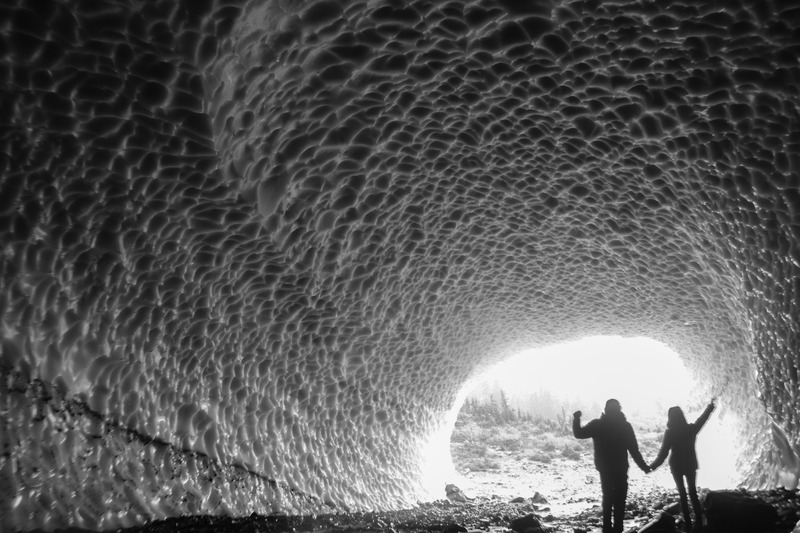 Now we’ve seen these ice caves all over Instagram but pictures just don’t do justice, you have to see these for yourself. 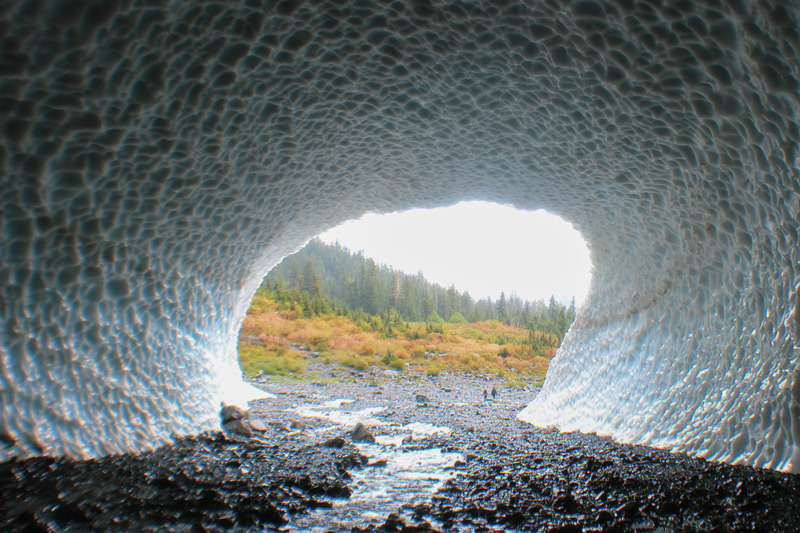 Please be cautious when visiting these or any ice caves. They can be dangerous and people have died. As amazing as these caves can be, please limit your time inside. We hiked back to the car just as it started to rain. We planned to stay in a hotel that night to reorganize the mess we tossed in the car during the storm and prepare our packs for our next backpacking trip. We got a hotel in Seattle and decided we would be tourists the next day and change it up a bit. They say that it’s always raining in Seattle but we enjoyed a beautiful sunny day. Brandon learned that Jimi Hendrix was buried in Renton, WA and wanted to visit. We later checked out the Space Needle/Museum of Pop Culture and enjoyed some BBQ before making way to Olympic National Park. We had about a 4-hour drive from Seattle to the national park and we got a late start on the road. 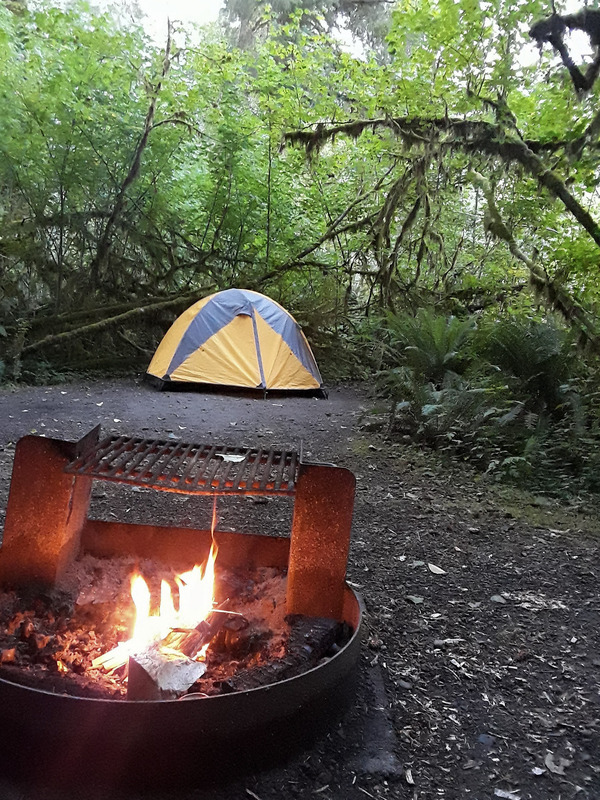 We would not make it to the national park that night, so we randomly picked a campsite that was in between Seattle and Olympic National Park and our winner was Campbell Tree Grove campground. We Google mapped our way to the campground and it was the longest, darkest forest route I’d ever driven. Irritated with the rain, we finally made it to the campground around midnight. After 20 something days of camping, with an occasional hotel, I was over setting up camp in the rain; we were sleeping in the car. We’ve slept in my car before, but this time my car was packed to the max. How were we going to make this work? Well, we stayed in our seats, unbuckled our belts and pulled out the blankets. Brandon being 6’3 made it impossible for us to both fit in the front. I wiggled my way to the back where I slept on our luggage/gear for the remainder of the night. It was a very long and rainy night, but it beats setting up in the rain. It must have been around 6 AM when I woke up Brandon and moved him to the passenger seat. I was eager to get to our next campsite. We took the same forest route out and back onto the main highway. We enjoyed a nice breakfast and finally arrived at Hoh Rainforest. Original plans were to go backpacking that day, but after the night we just spent we decided to car camp at Hoh Campground and backpack the next morning. Everything worked out for the best and the rain stayed clear. 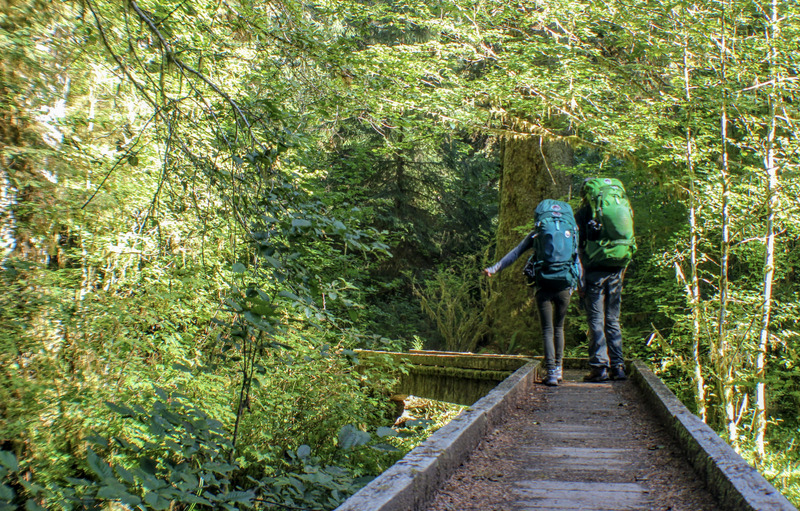 Hall of Mosses is a 0.8-mile loop located near the Hoh Rain forest Visitor Center. 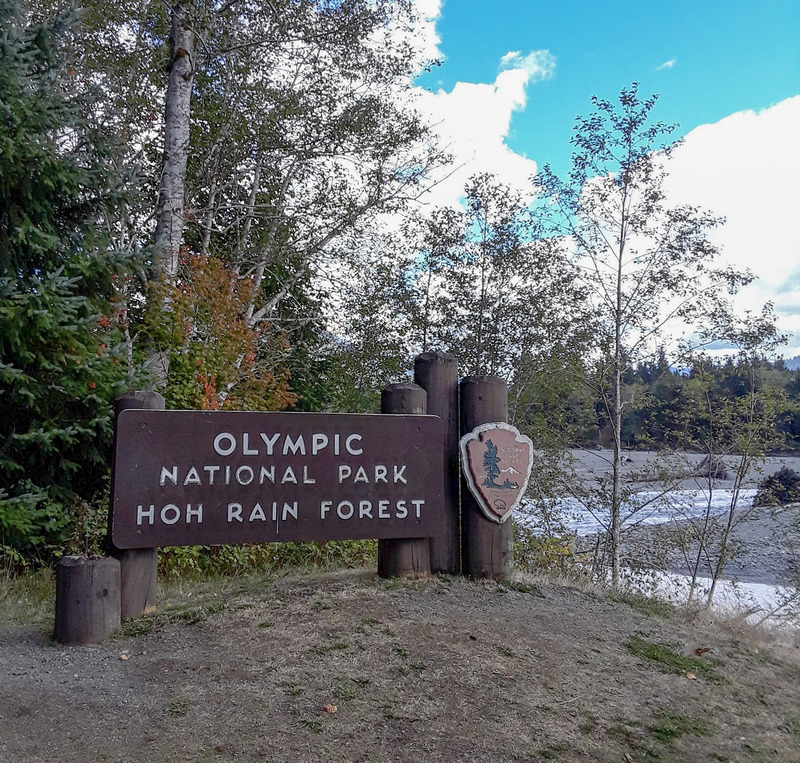 It is a popular, maintained trail and gives you a little taste of what the Hoh River Trail is all about. 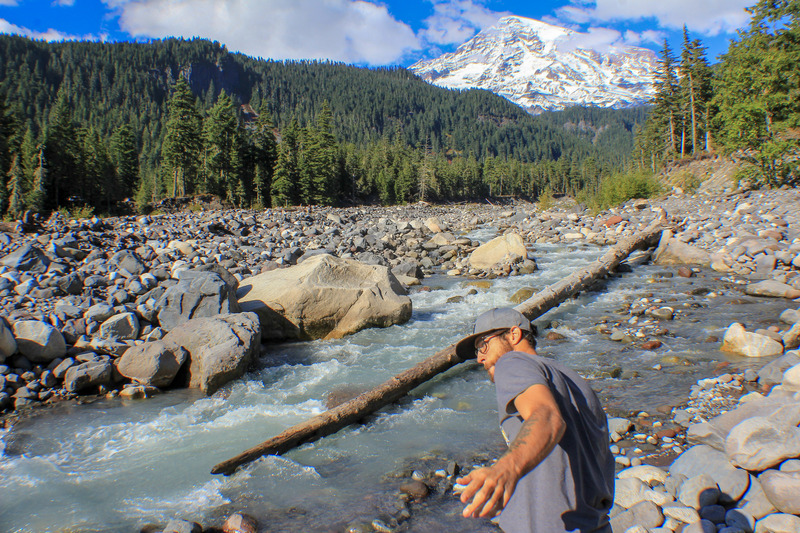 The Hoh River Trail is 26-miles starting at the Visitor Center and ends at Sol Duc. We stopped after 5 miles and camped at Five Mile Island. It was a beautiful and very interesting hike. We were actually hiking in the rain forest! 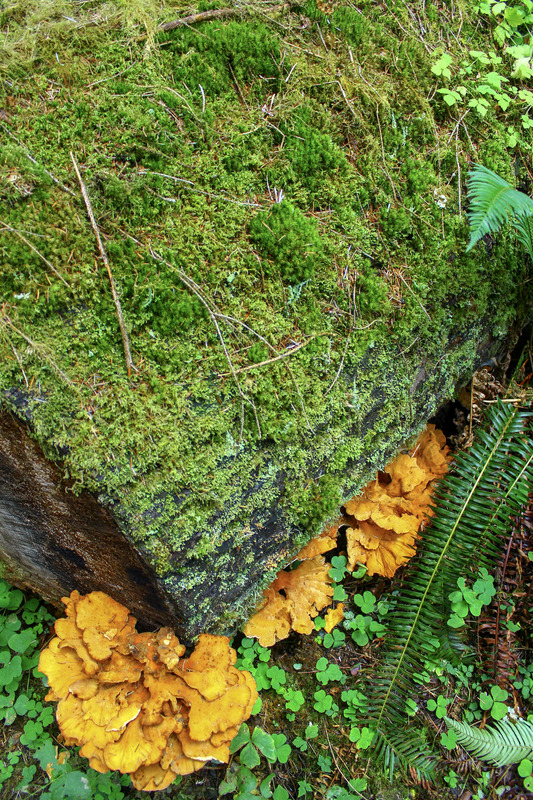 The colors of the trees and the mosses, the fungi and the insects were all so amazing to witness. We arrived early to our campsite and set up. To our surprise, we were the only people camping. 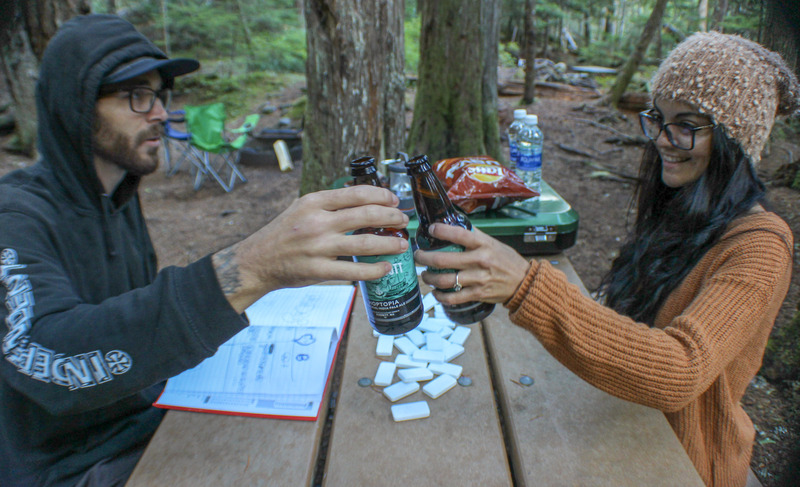 Once we set up and dropped our packs, we spent some time near the Hoh River and prepared lunch. The day was early and after running around the river we were getting hungry again. We also wanted to hike more. We so brilliantly decided that it would be a good idea to hike back to the car and make PB&J’s and have a beer. It was nice to do the hike again without our packs as we could move a lot faster. We ran through the rain forest and 5 miles back to the car. A well deserved second lunch. But we wasted no time getting back on the trail as we had to hike 5 miles back to camp. It was the longest 5-miles of our lives and a totally different experience. The sun seemed to set faster than normal and eventually, we were hiking back in the dark, even though we were prepared with headlamps and flashlights. We came across a few other campers and they were preparing to call it a night. We stumbled upon our campsite and immediately fell asleep. It rained all night but its what we expected sleeping in the rain forest. It was hard waking up to pack up and hike back out. But the rain forest was alive after all that rain and it was a beautiful morning. We eventually made it back to the car and our 20-mile journey came to an end. You bet we slept in a hotel that night. But not after Brandon checks out a nearby skate park in Forks, WA. When we arrived at Mt.Rainier, it was pretty busy. We were worried about getting a campsite within the park. We camped that night at Cougar Rock campground and went on a small hike after setting up. 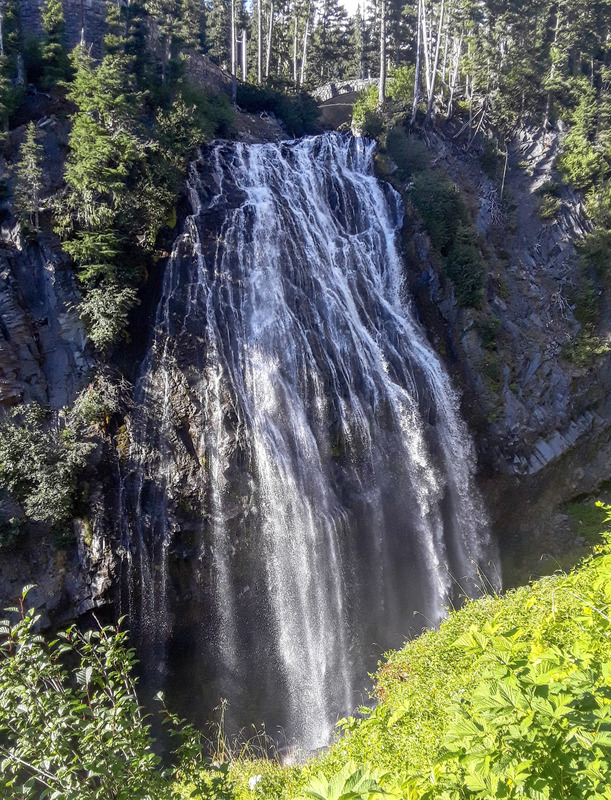 1.3-miles to Carter Falls via Wonderland Trail at Nisqually River entrance. It was a short but very nice hike and I will never forget the color of the Nisqually River. We headed back to camp to prepare dinner and an early night as we planned for a longer hike the next day. It was a chilly night and with just our luck, we woke up to a complete whiteout. Why did the weather seem so against us? We headed to the visitor center to check out the conditions and more snow was expected later that morning. We didn’t feel comfortable to hike in those conditions, so we drove around the park a little more before leaving. Our time in Washington was coming to an end and though we spent a little more time here than expected, it was totally worth it.